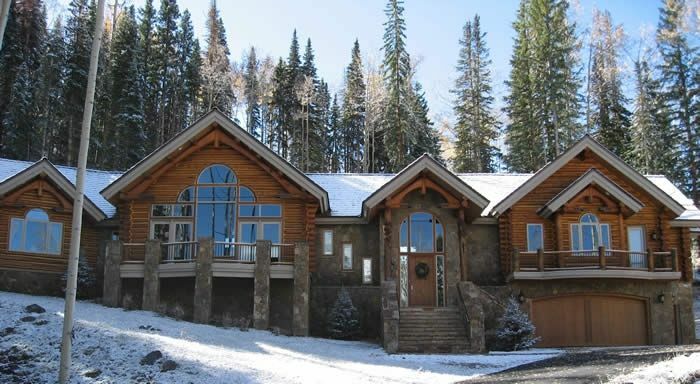 Luxury Telluride Mt Village Ski-In/Ski-Out home next to lift 10 & Double Cabins ski trail. Private log & stone retreat offers perfect blend of elegance & rustic architecture. Stunning views of San Sophia Ridge from almost every room. 4,800 sq ft, 5 BR + loft, 4.5 bathroom home situated high up in an exclusive neighborhood on Polecat Lane. Totally remodeled in 2007 with professional decorator. Private hot tub, upscale furniture, beautiful great room & views, 3 stone gas fireplaces, gourmet kitchen with Viking & DCS appliances & breakfast nook, office with desktop computer & wireless DSL Internet, flat panel LCD TVs, steam shower, & several decks! Sleeps 15. Master BR has king bed & other 3 main level BRs have king, queen, & 2 twin beds. Downstairs BR--queen bed and extra twin pull out bed. Loft has 4 twin beds with hiding place for kids. Store gear in separate heated ski room with lockers. Free Dial-A-Ride picks you up in an SUV & takes you anywhere in Mt Village. 1 mile from grocery store & Gondola parking. We live in Farmington, NM about 2.5 hours away so come to Telluride often year-round. We and our kids love to ski and snowboard in winter along with hiking and biking during summer. Absolutely perfect with amazing views! 5 families stayed here with plenty of space. The ski in and out is easy to find. Lots of spices, dry goods, etc. were there. Everything you need to cook easily. Snow was shoveled for easy access to the house. Linh was excellent at communicating! I can't wait to come back!! First, let me start by saying I am a HEAVY VRBO user and rent several ski homes a year around the country (and Canada). I have been to Jackson, Whistler, Telluride, Vail, Aspen, and several others. I am ALSO a VRBO home owner and rent my Vail ski home to renters as well. Needless to say, I have experienced the good and the bad over the years in renting homes. I have had many wonderful experiences but the experience my friends and I had in The Nguyen's home was without peer. From the very first communication with Linh, it was top notch. They are so helpful and incredibly responsive to my emails over the course of the pre-ceding months. Their welcome packet says there is an "initial supply of toilet paper and paper towels" and when we got to the house, the pantry had a years supply of everything and anything we could have needed. I brought extra dish soap, laundry detergent and paper towels (like I said earlier, this isnt my first rodeo with rentals) but the stash available was unreal. She even had hand warmers waiting for us and allowed us to dip into their stash of alcohol if we needed to (we did not). We got an extra hot tub cleaning "on the house" and plenty of towels and not to mention TWO washing machine and dryers. The house itself looks as beautiful as the pictures here on VRBO. It is gorgeous and perfect for our large group of 10 guys. Plenty of space so no one had to share beds with each other. This home would also be perfect for three families with kids. The house is true ski in and ski out and the heated ski room dried everything up over night. Kitchen is well set up and had every thing we needed and more. Beds were comfortable and the common areas were huge and great to hang out with. And the views.of the San Sophia range were without peer. I really cant say enough about this place. If you are a large (respectful) group or a few families looking for the best Telluride Mountain Village experience, look no further. This is your rental home. I feel bad giving this place only 5 stars after giving many other rentals 5 stars (which were all very good places). Definitely beats the other homes and home owners. Thank you Lihn Nguyen and family!!! The house was spacious and spectacular with great ski-in/ski-out access to Telluride. Linh was great and graciously left us chocolates and a bottle of wine for our stay in addition to a whole bunch of Hot Hands hand warmers! The house had all the bells and whistles including humidifiers in every room to combat the dry air given the altitude. The hot tub and back porch were very secluded and fun. Highly recommend! We stayed 3 nights 4 days and didn't want to leave.This home is HUGE, but with a cozy feel. It has many many fireplaces, spacious bedrooms and bathrooms. The kitchen, two sitting rooms, formal and casual dinning areas were perfect. The Kid's bedroom with multiple beds upstairs along with hideaway crawl spaces filled with toys and games were an extra spectacular treat! This home is ski in, ski out and so close you can hop on your skis to the runs. We can't wait to return! Fantastic home. Spacious accommodations for our group of 10 with great access to both Mtn Village center and Telluride via the beautiful gondola. Thank you so much for sharing your beautiful home! Perfect House & Perfect Trip! This house is really the perfect house for a family trip! We took our whole family of thirteen to Telluride. This included 8 Adults and 5 children. From the beginning the owners were easy to deal with and answered all questions. We had twins sixteen months old and the owners had pack and plays for both. The kitchen was great for cooking family meals. The hot tub was also great! It was close to the gondola so it was easy to get to downtown Telluride. All in all loved it!